Having a large family of Nikon D70 bodies includes insuring their overall health. I bought as many as I did because their purchase price dropped below what I would have pay to have one repaired. By having a fleet of these inexpensive (but capable) camera bodies means that when when one no longer functions, I can simply sell it for parts, and go to my equipment closet and draw out another. There has been a lull in Journal assignments and a quick turn-around time for sensor cleaning at my preferred camera retailer, so I started to bring in my second string, then my first string, bodies in for cleaning. In all I had five bodies in my combined first and second tier bodies, but my third tier D70s needed some attention. I described a relatively simple system for checking your on DSLR's sensor for dust spots in this post. For my D70 and D70s bodies, I decided to check them with my Sensor Scope and found that nearly all had some dust on their sensors. At $50.00 per body, I was looking at a sizable cleaning bill if I were to clean every camera body. Faced with this potentially large expense, I decided to explore cleaning the sensors myself. For many years, manufacturers discouraged individuals from cleaning their own sensors. However, if you checked You Tube, you could find clips, submitted by Japanese photographers, showing hobbyists cleaning their own sensors using readily available sensor cleaning kits. I was a little hesitant to do this myself, being content to use my Sensor Scope to look for dust, and delegating the cleaning task to a professional when enough dust was found. 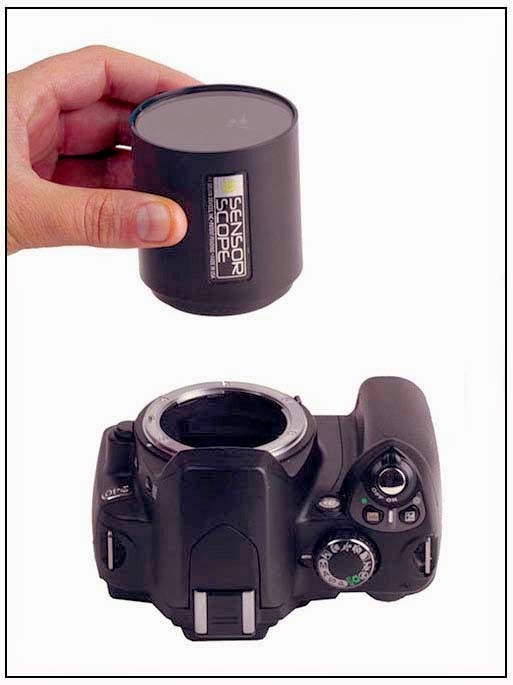 But is seems that the new breed of Interchangeable Lens Compact (ILC) cameras has prompted dealers to encourage the do-it-yourself approach, perhaps because the sensor was more easily seen and accessed when no mirror was present, or because these cameras are more likely to be used by amateurs who wouldn't pay for a professional service anyway. In fact, the cleaning supplies were prominently displayed by the display case reserved for ILC cameras and accessories. 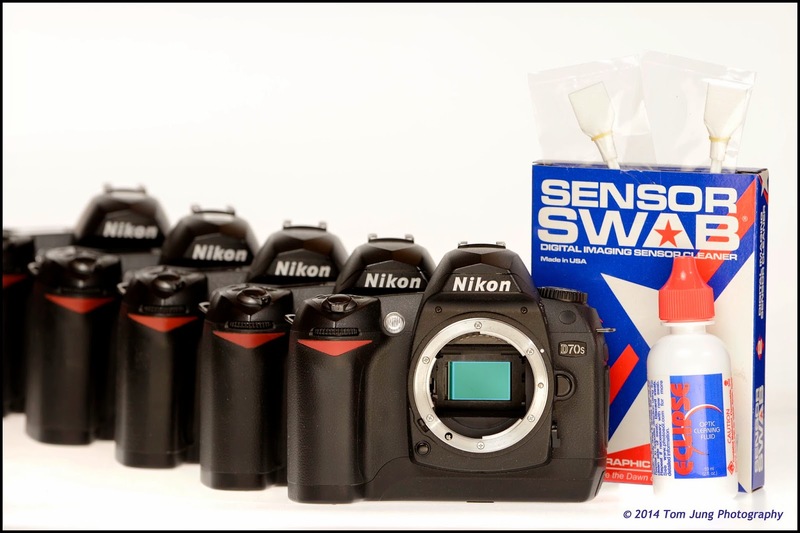 I spoke briefly with the sales person, and determined that for my Nikon SLRs with APS sensors, I would need to purchase the proper sized sensor swabs and some cleaning solution. I walked out with a bottle of Eclipse Optic Cleaning Fluid and a box of 12 #2 sized Sensor Swabs from Photographic Solutions. The swabs come in three sizes: Size #1 is for micro four-thirds, #2 is for APS sized sensors, and #3 is for full fame cameras. One caveat from their website: Only ECLIPSE Optic Cleaning Fluid may be used to clean traditional CCD, CMOS and Tin Oxide sensors. Now I'm the kind of guy who reads the instructions before starting an unfamiliar project, so I'll simply say that if your camera is NOT listed on this chart, you shouldn't use this method of cleaning. You can see a detailed video on how to clean the sensor. Just click here to see exactly how it's done. On final note: The instructions clearly state that you may need as many as four swabs to get your sensor clean (the swabs are used only once - one left stroke and one right stroke). I would still suggest that you get a Sensor Scope (or a similar product) and use it to check your sensor after each swabbing. 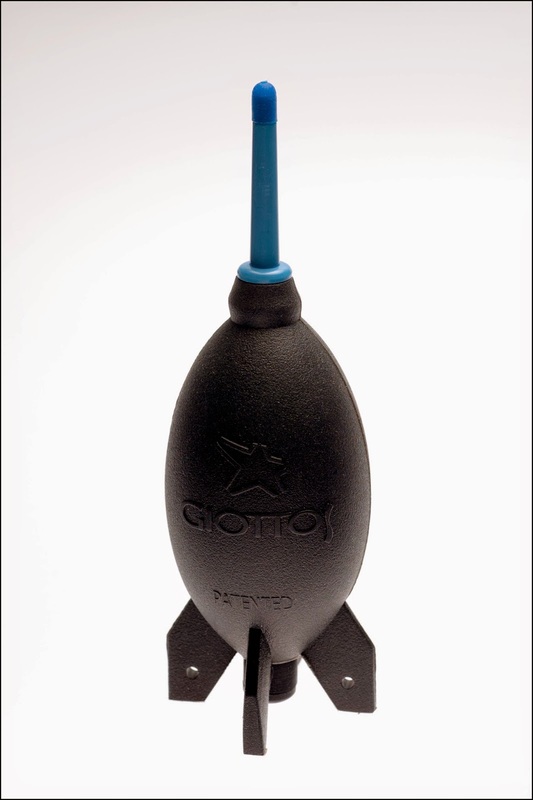 And don't forget that a blower like the Giotto Rocket Blower, may be all you need to to blow away the loose dust. The blower, besides having a cool "rocket" shape, has an internal filtration system to prevent it from sucking in airborne particles and blowing them onto your sensor, in important feature. You might just find out that a little "whoosh" from your Rocket is all you need...for now.